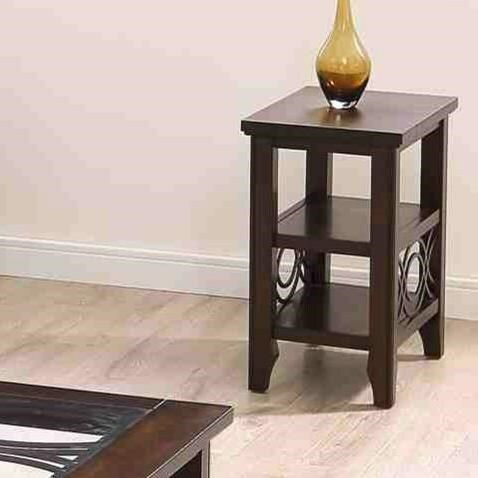 Fretwork at the sides and under the inset glass top add an open appeal to this chairside end table. The dark brown cherry finish over birch veneer offers contemporary style, while the table's two shelves offer storage. The Brayden Chairside Table with 2 Shelves at Miskelly Furniture in the Jackson, Pearl, Madison, Ridgeland, Flowood Mississippi area. Product availability may vary. Contact us for the most current availability on this product. The Brayden collection is a great option if you are looking for furniture in the Jackson, Pearl, Madison, Ridgeland, Flowood Mississippi area.